When George Angohiatok is looking for a big bear near Cambridge Bay, Nunavut, he heads out to the roughest sea ice. His elders taught him that's where they are. 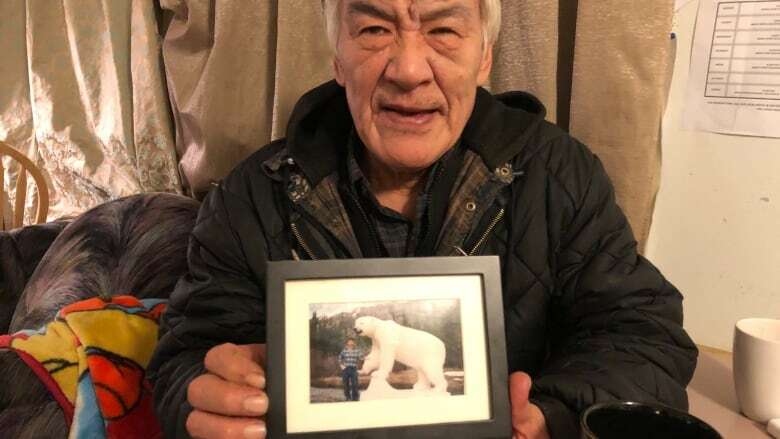 Angohiatok's wife drew one of the hamlet's six polar bear tags this winter, so out he went. Conditions were so rough, he had to turn around and find a smoother path, a potentially costly decision when there's only a 10-day window to harvest a bear. "The rough ice, it would stand in some parts, probably five metres high. So it's really extreme and some of this ice is two to three feet [61 cm to a metre] thick," he said. "Very dangerous. I avoid driving into that situation where we can't turn around and get back." A new online mapping project is now helping hunters in Cambridge Bay and Kugluktuk avoid those rough patches, saving time and making travel safer. The project, a collaboration between the University of Victoria's ICE lab and Inuit hunters in the two Nunavut communities, uses radar images, which can penetrate the clouds and darkness of a Nunavut winter. Becky Segal, the researcher who designed the maps, uses radar images to learn more about ice conditions from an academic point of view, but she thought there had to be a practical application too. "I also wanted to see how they could be useful to people in the North and community members who travel on the ice." Segal brought the maps to the communities and showed them to people like Jimmy Haniliak, who helped focus the project on sea-ice roughness. Haniliak already had some experience reading radar images of the ice when he was on patrol with the Canadian Rangers. "I'm glad I met her," he said, adding he has been asking for years about how to get access to radar images for his community. "Without these maps, I would just be travelling blind, doing detours, but looking at these maps I'm able to pick the best route to the mainland. It's gonna save me time and it's gonna save me a lot of gas." Haniliak took Segal out on the ice when she was in Cambridge Bay, stopping along the way to compare notes about the ice conditions. When Segal talks about that trip, you can hear excitement in her voice. As an expert in reading radar images, she said, she has respect for the knowledge Inuit bring to the project. "One of the things that stuck out for me is that you can't just use the radar map to navigate. You definitely need the local knowledge and practical experience." Segal said she has heard from people who say they are now able to plan for longer trips, travelling further distances. "One woman who told me that it's really helpful to be able to plan accurately when you have your young son in the back of the sled," she said. The maps are available on Cambridge Bay's community Facebook page. Segal is also developing a website where people can log on free to see the real-time radar images.